Spinach is a cool-season annual. Sow spinach indoors 6 to 8 weeks before the last average frost date in spring. Sow spinach outdoors or set out transplants 4 weeks before the last average frost date. In mild-winter regions, grow spinach in late summer or early autumn for harvest in autumn or winter. Site. Plant spinach in loamy soil rich in organic matter that is well-drained with a pH of 6.0 to 6.8. Grow spinach in full sun or partial shade in warm regions. Spinach is hardy and thrives in cool weather; ideal spinach weather is 10°C to 20°C. Warm weather and long days will cause spinach to bolt or go to seed. Planting time. Spinach is a cool-season annual. Sow spinach indoors 6 to 8 weeks before the last average frost date in spring. Sow spinach outdoors or set out transplants 4 weeks before the last average frost date. In mild-winter regions, grow spinach in late summer or early autumn for harvest in autumn or winter. Plant succession crops of spinach every 2 to 3 weeks. Refrigerate seeds 1 week before sowing to help germination. How to plant. Plant spinach seed ½ inch deep, 2 to 4 inches apart, in rows 12 to 14 inches apart . Thin spinach to 12 inches apart when seedlings are 3 inches. Thin to the strongest seedlings. Care. Keep planting beds free of weeds to avoid competition for light, water, and nutrients. Cut weeds at soil level to avoid damaging the shallow roots of spinach. Spinach will bolt in temperatures greater than 25°C. Container growing. 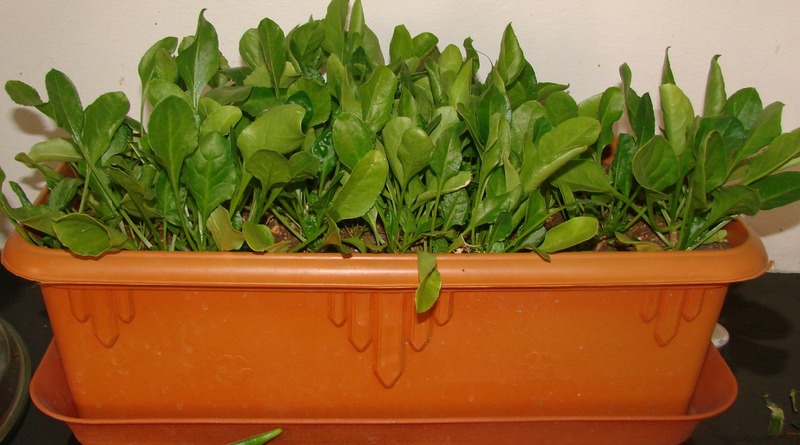 Spinach will grow in a container. Allow one plant for each 8 inch pot; in large containers plant spinach on 10 inch centers. Spinach is heat sensitive; move containers into the shade on warm and hot days. Containers will warm more quickly than garden soil in spring. Harvest. Spinach will be ready for harvest 40 to 52 days after sowing. Cut leaves 4 to 7 inches long from plants with 6 to 8 leaves. Allow young leaves to grow on to maturity. If you take all of the leaves, cut them 3 inches above the soil and they will grow on for a second harvest. Wash spinach thoroughly to eliminate the grit that sometimes sticks to crinkled leaves. So follow these simple steps and grow spinach at home. Don’t forget to share this post with your family and friends! Next post: Simple Home Treatment For Hypothyroidism. Must Read!!! Previous post: Like Fried Foods? Aloo Palak Bhajiya Is The Dish You Must Go For!! !